Limited to 1,200 copies, with a new, custom inner sleeve! It was the No. 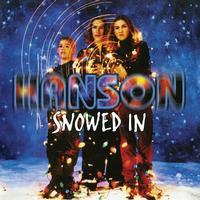 1-selling Christmas album of 1997, and has sold more than 1 million copies in the U.S. and 2 million copies worldwide. So how come Snowed In hasn't come out on vinyl yet? Beats us...but we have a feeling that this platter ranks at the top of a lot of Christmas vinyl wish lists! This is Isaac, Taylor, and Zac mere months after their worldwide breakthrough album Middle of Nowhere and its huge hit "MMMBop," and it presents holiday favorites ("White Christmas"; "Silent Night"; "Rockin' Around the Christmas Tree") both secular and sacred, mixed with Hanson originals "At Christmas," "Christmas Time," and "Everybody Knows the Claus." With a label of their own, and a busy tour schedule, the boys (now full-grown family men) have come a long way since their Tulsa, OK days, but this charming Christmas album captures them right at the beginning of their All-American success story. Christmas Tree Green vinyl limited to 1,200 copies, with a new, custom inner sleeve!